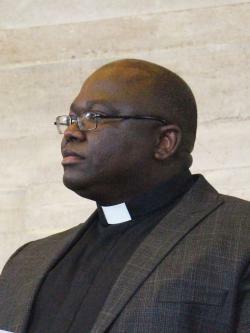 Vincent Jambawo joined Selly Oak Methodist Church from the Amersham Circuit. With a background in teaching and human rights, Vincent has an insatiable love for people from all backgrounds. By his own admission, Vincent doesn’t always know what to with this overflowing passion for people but he is keen to shake your hands, walk with you, run with you, sit down with you to tell and hear stories. In your joys, Vincent would want to celebrate with you. In your anxieties and fears, he would love to reach out for you. ‘I will cry with people and I will laugh with them’, he always says. Contrary to popular perceptions and eminent wisdom, Vincent has tremendous faith in the capacity of humanity to do good, and he believes that an outward-looking and inclusive Christian church is an amazing place for the positive transformation of individuals and communities. In a world that is increasingly shaped by grandstanding projections of power at all levels, Vincent believes that vulnerability and openness to God’s prevenient grace is the light shining into the darkness of our humanity, enabling us to celebrate and respect our differences, while drawing all of us together in love and mutual dependence. In the coming days, weeks, months and years, Vincent is confident you will become more acquainted with his clumsy speech, timid manners and bungling conduct! ‘In sharing our vulnerabilities safely and lovingly, lie the seeds to grow our strengths and fulfil the unique gifting of our individual and collective calling(s)’, he says. Vincent is married to Leah and they are blessed with one daughter (Vanokoshesa) and two sons (Urukaitapembedzwa and Izwiramambo).